Professionally manufactured cassette with black print on purple shells. Limited to 300 copies only! HELLS HEADBANGERS is proud to present the long-awaited third album of legendary Greek black metal institution AGATUS, The Eternalist. Rendered in warm analog tones, gritty but full of life, AGATUS' The Eternalist is an epic journey across the hinterlands of the imagination. In many ways, it follows the heavy metalled direction of 2002's celebrated The Weaving Fates but incorporates the proggier textures of 2012's Gilgamesh EP, thus ushering in a new era for the duo that's respectful of the past but sets its sights on the future - and the unknown. Says founder The Dark, "The Eternalist reflects another dimension of my compositional style whilst maintaining the signature sounds that AGATUS are known for. 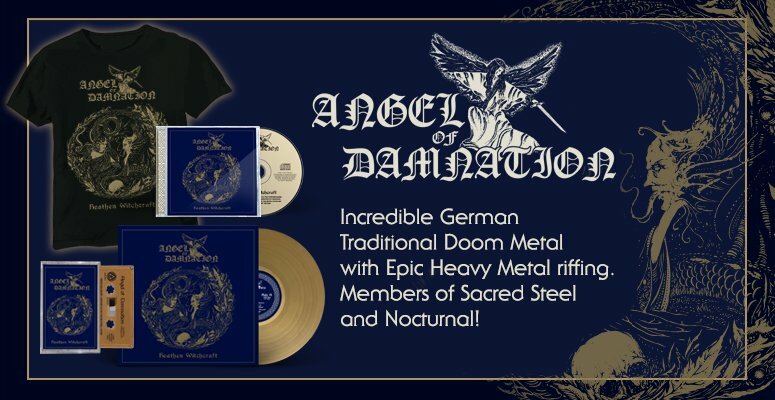 Here I delve further into old heavy metal sounds that have always been an inspiration to me and created what I consider my most memorable album to date." Kaleidoscopic in its vision, with The Eternalist, AGATUS set a clear course toward older sounds and atmospheres: a golden ratio combining the feel of NWOBHM with '70s rock and everything that you have come to know and anticipate of these two brother musicians over the years. Vorskaath adds, "We decided to take an old-style hard rock/heavy metal approach that is manifest on every aspect of the album, from the performances and recording to the sounds we chose and the way we mixed. From the very first notes of The Eternalist, that feel is unmistakably there." With HELLS HEADBANGERS' full backing of this unique and visionary cult, AGATUS will reclaim the momentum achieved during the early 2000s and venture forward into previously untouched realms of glory. Formed in 1991, AGATUS belong to the first wave of black metal bands to emerge from Greece and consists of The Dark and Vorskaath - brothers and founding members. Their first album, 1994's Dawn of Martyrdom, commanded a cult following as a milestone in Greek black metal, and their followup, The Weaving Fates, received critical acclaim for the musicality and individual sound of the band, which has remained largely a side-project. Three EPs - The Rite of Metamorphosis, Night Mares, and Gilgamesh - have also been released, showing the steady evolution of a band whose exploratory excursions never rest. The Dark and Vorskaath are also known for their collaboration with artists such as ZEMIAL, Varathron, Absu, Alpha Centauri, Kawir, Equimanthorn, Raven Black Night, Stone Cold Dead, Mark Riddick's Fetid Zombie, and many others.